Rainmaker Polymers offers a complete line of unfilled, filled and reinforced compounds that are available in a variety of resin systems. 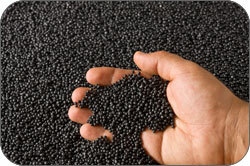 In addition to a portofolio of stock grades, Rainmaker Polymers can custom formulate compounds to meet the exact needs of your application. These compounds can also be offered as economical pellet blend of higher loaded masterbatches with unfilled resins to achieve the desired filler level and can be precolored to match your specific standard.